Mexico City is a hot (as in temperature and high vibe) international tourism destination at the moment, and the cultural epicenter is only forecasted to grow in popularity for years to come. 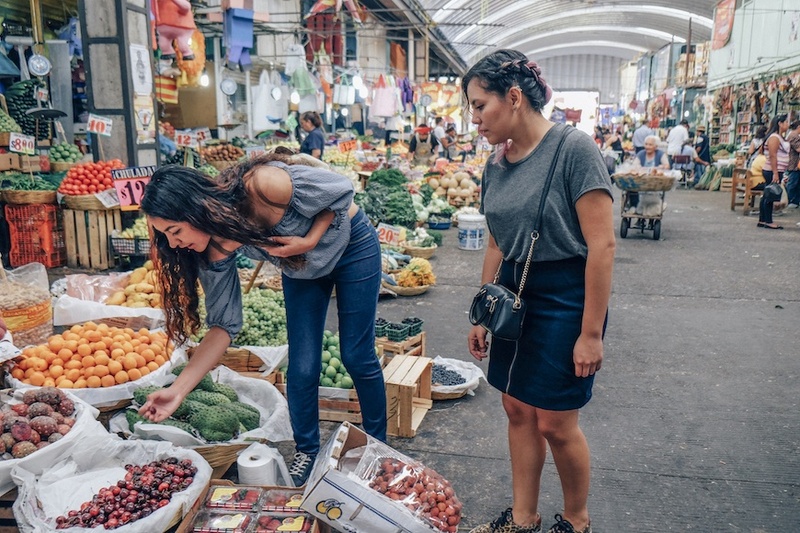 Beyond access to ancient ruins and world-class museums, Mexico’s capital is home to a lush climate that supports a variety of local fruits and vegetables that color its rich traditional dishes, which—it’s worth noting—are abundant just about everywhere. With street vendors hawking affordable, authentic, finger-licking meals on nearly every block, it’s impossible to go hungry here…if you follow the meat-loving paleo diet, perhaps. When ordering food, be super inquisitive about how the food is made, but also take care to ask the right way. Simply inquiring whether something is vegetariano won’t help you because the server or food vendor may harbor a different definition than you. For example, some may think that you’re not okay with red meat but are perfectly happy with fish or chicken. Others may not realize that even meat broth used in prep is a no-no for you. So, clearly list out the foods you do not want to eat to the person serving you: meat, chicken, fish and seafood (“no carne, pollo, pescado y mariscos”). And always inquire into whether foods are made using meat by-products. How you phrase the questions is also important. One friend told me that—particularly at street food carts—the vendor may lie about the contents if worried that you won’t buy otherwise. Rather than simply asking whether a tamale is made with lard (pig fat), for example, she suggested saying you’re allergic or that the ingredient makes you sick, as food-ordering insurance of sorts. Sure, dishonesty isn’t the best policy, but in this case, better safe than sow-ry (had to). Just get in the habit of inquiring about all items (though simple salads with oil and vinegar dressing can be assumed to be meat-free) because animal-based ingredients can totally show up in unsuspecting places. Take those tamales for example—even the queso-only ones. They’re not always vegetarian, because they’re often made with lard (“la manteca de cerdo”). However, some tamales are simply made with canola oil. So, ask—also about salsas and rice that are sometimes made with chicken broth (“caldo de pollo”), and frijoles (or beans) that are sometimes cooked with lard. Also keep in mind that street-food vendors cook all food on the same grill, so there is always the possibility (and, TBH, probability) of cross-contamination with any and all items on the menu. The best practice here is to ask if the vendor might be willing to sanitize the grill to your liking before cooking your order. Of course, the likelihood of this happening will depend on how well the vendor understands you, how busy business is, and how gracious you are. A tip tends to help your case. Sadly, taco carts don’t generally cater to vegetarians. For the most part, they feature a basic combo of tortilla plus meat, with a smattering of chopped onion, herbs, and whole green onions that have been simmering in meat broth. (OG taco carts don’t even serve queso.) And it’s tough—and not so healthy—to make a bona fide meal of tortilla and cilantro, so it might be best to admit taco-cart defeat and move on. For breakfast and snacks, stock up on fresh fruit like bright orange guava, papaya, melon, citrus, and more. You can also make the cheapest avocado (or aguacate) toast of your life. But other street-food carts featuring a range of masa (a dough of ground corn) options beyond just tacos are quite vegetarian-friendly. Be on the lookout for ones that have buckets (literally colorful plastic beach buckets) of toppings that you can add to your order free of charge. For example, you can order a huarache sencillo—an oblong piece of fried masa dough with a thin layer of smashed pinto beans in the center—and load it with nopal (prickly pear), onion, queso, tomatoes, and pickled vegetables for a heaping plate. Furthermore, Mexico City markets, mercados, sell unbelievable produce that will make vegetarians feel as though they’ve stumbled into heaven. For breakfast and snacks, stock up on fresh fruit like bright orange guava, papaya, melon, citrus, and more. You can also make the cheapest avocado (or aguacate) toast of your life. Restaurants and carts also tend to offer a variety of juices (jugos) and smoothies (licuados) that cater to whatever combination your stomach desires. I’ve found that restaurants are happy to substitute available vegetarian-friendly options in dishes or leave out the meat entirely. (But, do remember to ask about cross-contamination, depending on your preferences.) Some obvious alternatives are eggs, mushrooms, grilled vegetables, potatoes, beans, and cheese. Flor de calabaza, or fiber- and vitamin-rich squash blossoms, are one surprising go-to that’ll change your life (or at least your favorite quesadilla order) forever. Furthermore, a multitude of dishes can easily accommodate vegetarian-friendly substitutions, including chilaquiles, enchiladas, tacos, quesadillas, and tostadas. And tortas, or sandwiches, tend come with meat, but you can ask for a customized one with cheese and veggies. Basically, armed with the right knowledge and questions to ask, you’ll be raving about the Mexico City food scene to the same extent as your carnivorous travel companions. After Mexico City is off your bucket list, check out Munich, which offers a surprising amount of vegetarian-friendly food options. And remember, you don’t have to travel to satisfy your Mexican food craving. Try these keto-friendly cauliflower enchiladas at home.